The painting that I showed at the bottom of my last post has evolved several more times. 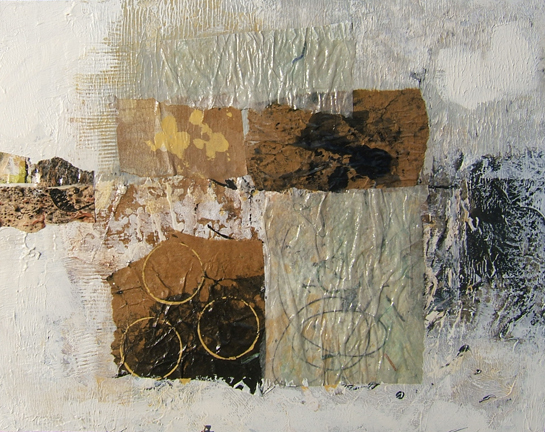 It has acquired more texture and some collage elements, along with some scribbles and stamped circles. Here is the canvas — I’ve shown it on this blog before, but had forgotten exactly which one it was. I think the title is still “Work in Progress.” It sits in my studio stack at the current and possibly final stage. Here is a link to a post in which I showed some steps this canvas went through in its previous incarnation. Went back to look at before pics. What a transformation. I love this final? pic. Sometimes hard to tell what direction a canvas is going to take, Pat! Thanks. I think it’s final. Wouldn’t believe this is the same. It reminds me a lot of your paper collages. I’m starting to get lost in it and dream. What an achievement. Thanks so much, Eva. That’s a nice thing to hear.